Is anyone here planning to attend the Ft Worth show on November 7? The location is the Lockheed Martin Recreation Area, 3400 Bryant Irvin Road, Ft Worth, Texas 76109. I'm loading the truck with NOS rubber and other parts and pieces for the swaps. Larry is taking his DC there to get pics for the vw mag. I dont think ill make it, maybe. Shocker to everyone... but I wont be able to attend either... would like to, but have other obligations for that weekend. 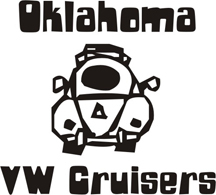 PS: I will be sporting my "OKLAHOMAVWCRIUSERS" club logo decal on the back glass of my ghia. Show update. Larry took first in early T-2, Anthony took second in early T-1 and best engine and well I won a new in box laptop computer in the raffle. It was an awsome show. Gave out lots of club cards to Oklahoma cars and all who didn't come missed out. Can't wait till next years show... Also the photo shoot for Larrys double went well and we also purchased tons of NOS early VW parts. Yeah thats pretty funny. Waylon is a swell guy. Has a super nice green double cab. He was a member on the old website as well. Im going to post pics up of the show as soon as I get a chance to. I think they had about 300 to 350 cars there at last count of the show annoncer.